With temperatures in New York topping out in the low 90’s yesterday and predicted to hover around 88 today, Mother Nature has clearly proclaimed that summer is far from over. The kids may be back in school (and amen for that) but there is still plenty of barbecuing and beach going to be had. At this lovely time of year, corn is at its sweetest, crispest, most delicious peak. It’s the perfect beach or poolside food on a hot late summer day. Most of the time, I’m a minimalist when it comes to corn, I skip both the butter and the salt and enjoy it just as it is. But when I’m in the mood to dress it up a bit, I like to get creative. 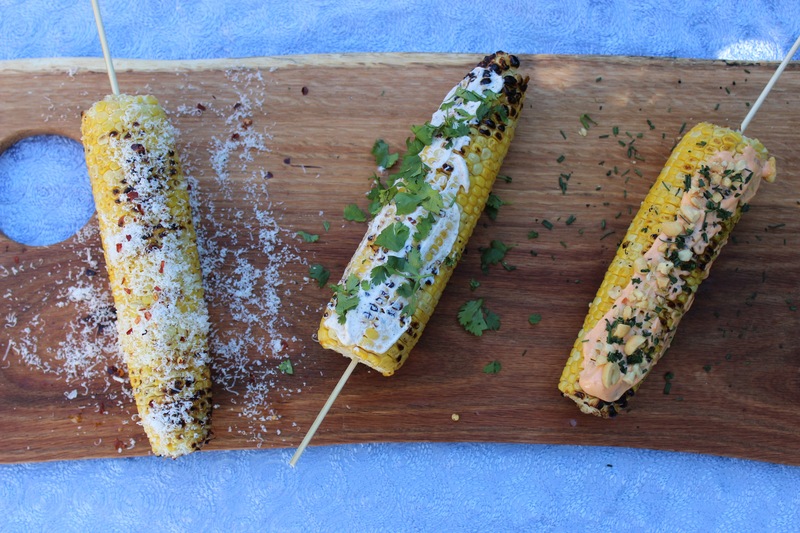 These three ideas for jazzing up your corn cob should get your creative juices flowing too. The sky really is the limit when it comes to the spreads that work with corn. I think you’ll find that it’s a beautiful palette on which to paint. There are also about a million and one ways to cook ears of corn. You can boil, steam, roast, or grill. And within those methods there are variations involving husk or no husk, tin foil, or bare. My preference is to grill corn after it has been husked (and thoroughly stripped of silk). First I lightly grease each ear with spray oil. I grill on direct heat for about 5 minutes, turning it occasionally so that it blackens in places on all sides. Then I move it to indirect heat and close the lid for 7 to 10 minutes more. Lastly, I enjoy my corn with a cold beer spiked with lime. Perfection. In a small bowl, combine the yogurt, garam masala, and lime juice and mix to combine well. Spread each ear of corn with about 1 tablespoon of the spiced yogurt. Sprinkle each with 1 teaspoon of the cilantro and serve. Spread each ear of corn with about 1 tablespoon of the sriracha mayonnaise. Sprinkle each with 2 teaspoons of crushed peanuts and chives to garnish. Serve. Drizzle each ear of corn with 1 teaspoon of oil and roll in 1 tablespoon of cheese. Sprinkle each with 1/4 teaspoon of pepper flakes and 1/4 teaspoon of sea salt and serve. This entry was posted in appetizer, side and tagged corn, corn on the cob, grilling, Parmesan cheese, sriracha mayonnaise, yogurt. Bookmark the permalink.